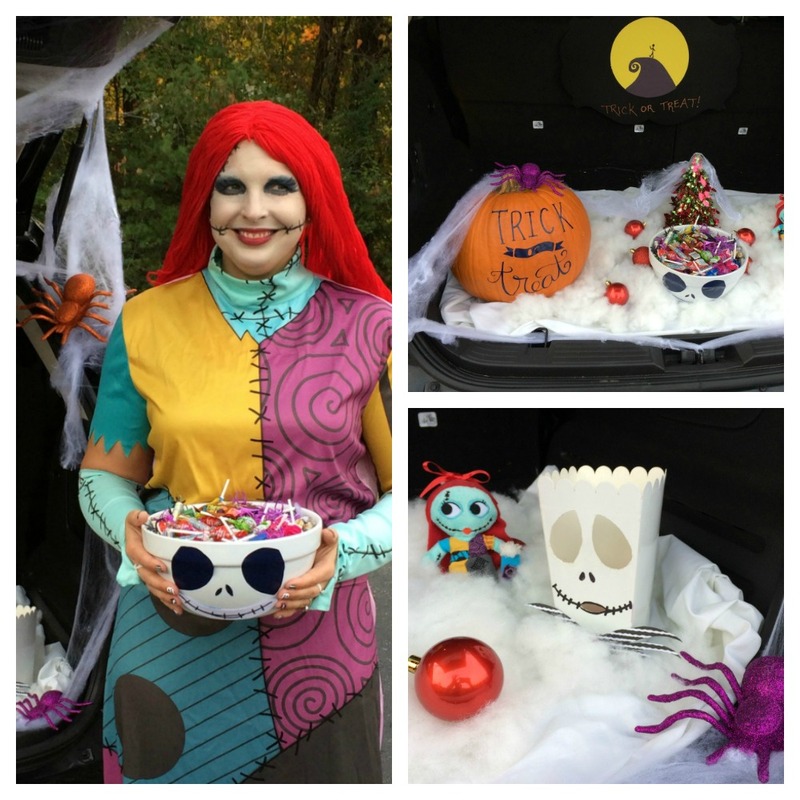 Halloween is one of my favorite holidays and I love to dress up and participate in our church's Trunk or Treat. 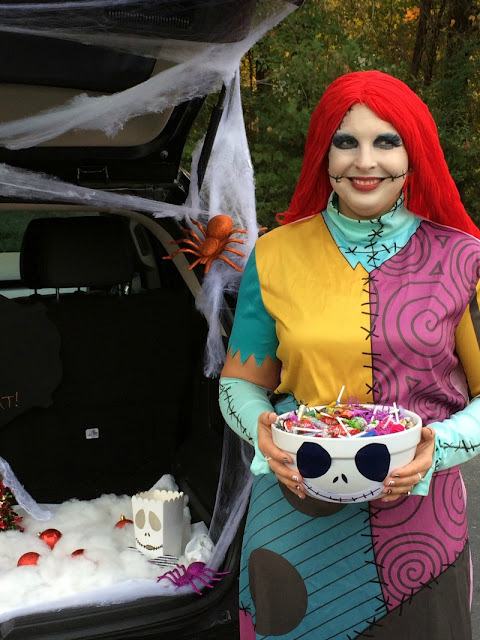 Last year I went with a Nightmare Before Christmas theme since it is one of my favorite movies. 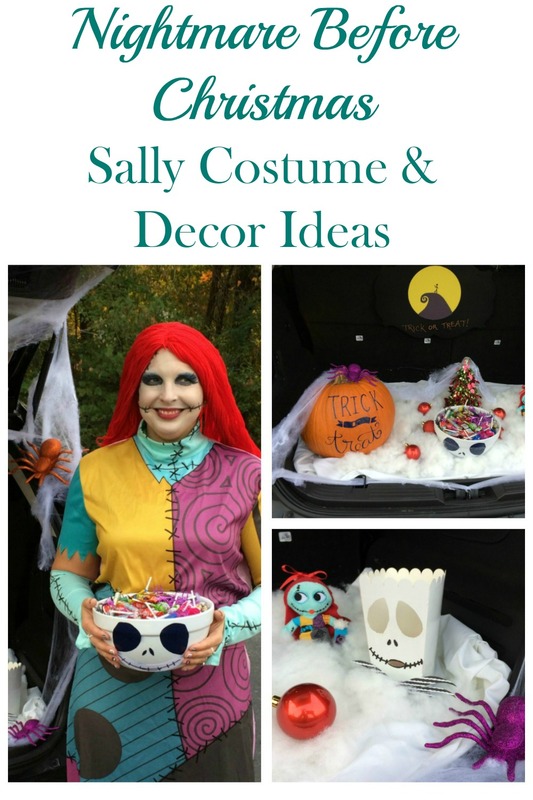 I am going to show you how I transformed myself into Sally and DIY'ed my trunk into Halloween/Christmas town! I usually DIY my costumes, like the Mad Hatter and Flo, but I had the Sally costume on hand from several years ago, so I figured it was time to re-use it. The costume came with the dress, sleeves, and wig. I took a pair of white tights and used a sharpie to draw stitches on it to match the sleeves. I also found a pair of black and white striped knee socks at TJ Maxx and scrunched them down into black boots to complete the ensemble. For my face, I searched Pinterest for inspiration and loosely followed this look. I used white Halloween makeup to cover my face. I drew on stitches with black eyeliner and applied bright blue eye shadow in a large ring around my eyes. I drew in the eyelashes and finished the look with red lipstick. 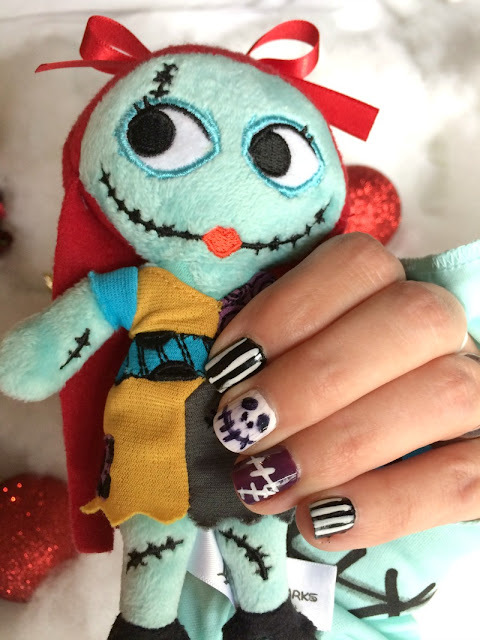 I even painted my nails in a Nightmare Before Christmas theme! 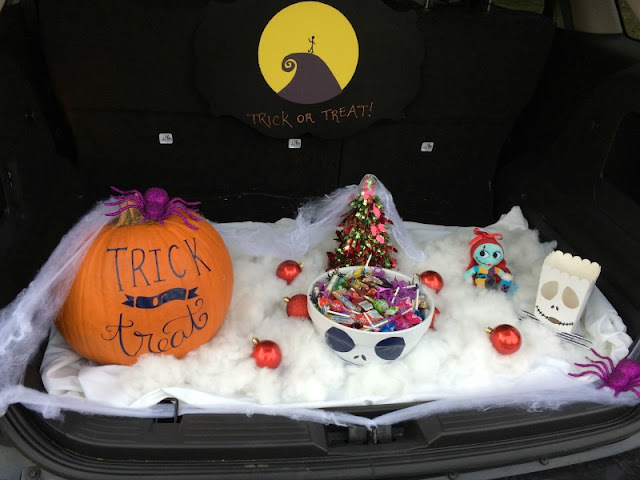 I had so much fun transforming my trunk into Halloween/Christmas town and had most of the supplies on hand already. You can find most of the items I used at Dollar Tree! I used my Cricut to cut out the "Trick or Treat" saying out of vinyl for my pumpkin. You can check out the full tutorial in THIS POST. I downloaded the free .svg file from Pitter & Glink, if you want to grab it for yourself. 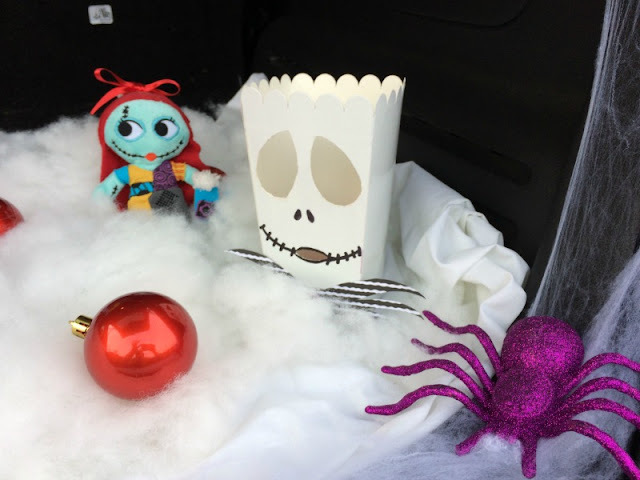 I used a popcorn box to make a luminary that looked like Jack Skellington, cause Sally needs her Jack! If you want to make your own, head over to this post to get the tutorial. Speaking of Jack, The first time I wore this costume, my hubby dressed up as Jack. He wore a black pinstriped suit and hat and I painted his face to look like Jack. I also made him a cardboard spider bow tie similar to the one on the luminary. It was epic! 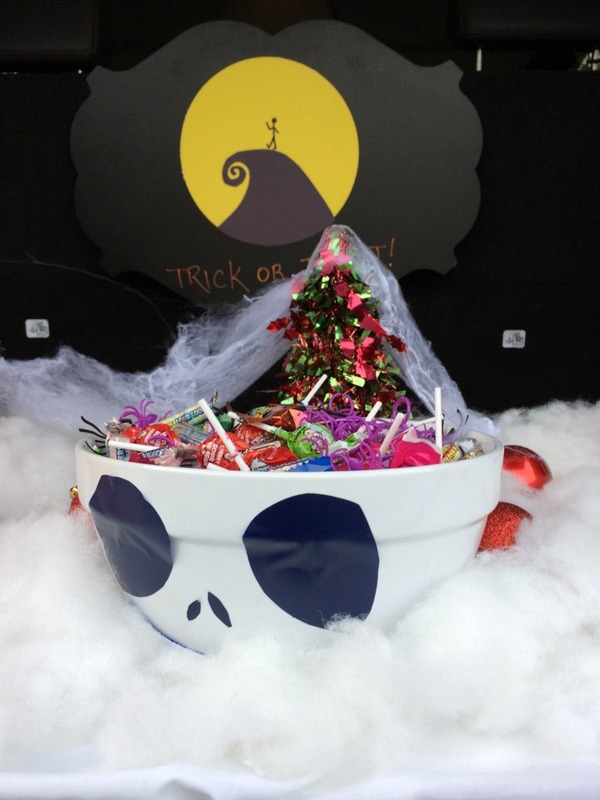 I also made a Jack Skellington candy bowl by cutting his eyes, nose, and mouth out of vinyl and applying it to the bowl. I made the backdrop from card stock and taped it to a magnet board hung on the back of my seats. I added some large glitter spiders and fake cobwebs, round ornaments, and a mini Christmas tree from the Dollar Tree and spread out poly-fill I had on hand to look like snow. 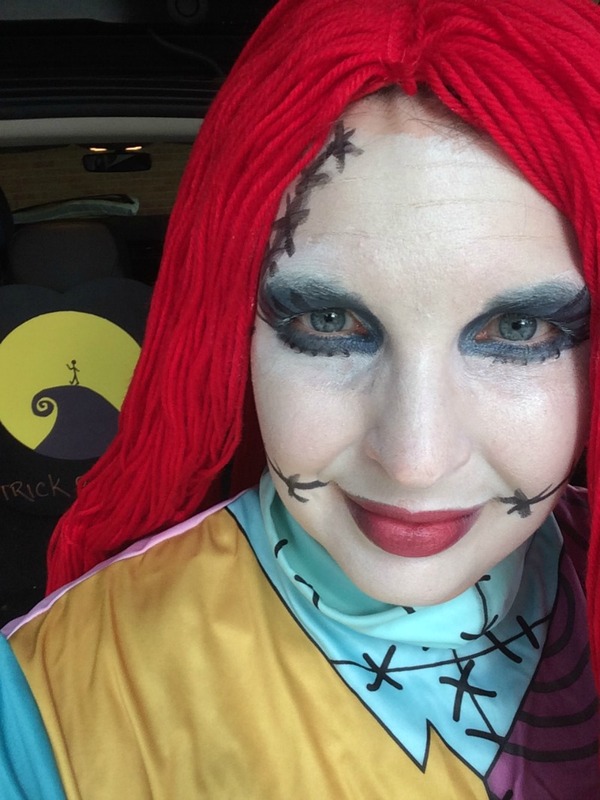 If you love Nightmare Before Christmas like I do, then make sure you PIN THIS! Do you dress up for Halloween or participate in Trunk or Treat? If so, leave me your favorite ideas in the comments below! While you are at it, Pin my Jack luminary too! 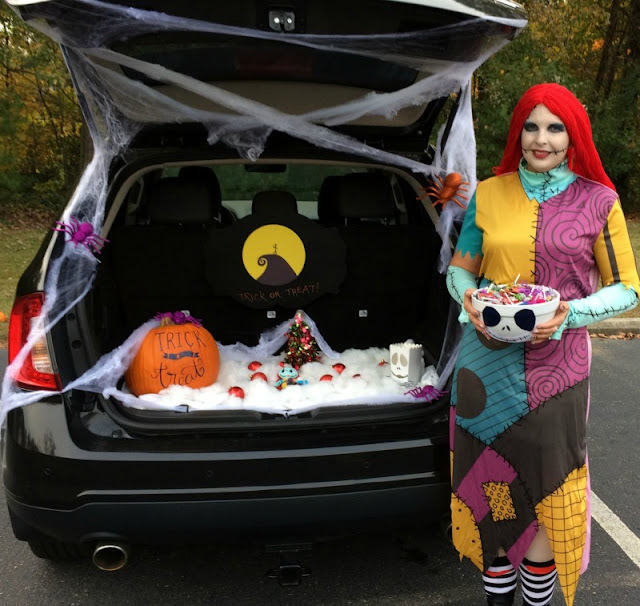 We have trunk or treat coming up and I need to start thinking about it. I just love your trunk (do you have a Honda CRV? I was just wondering if we had the same car- but I can't tell for sure!) and your makeup, nails, etc. You really went all out! I just started thinking about what I am going to do this year! I actually have a Ford Edge, but I think they are similar styles. I love to go all out for Halloween! It is so fun! How fun! Love it! Pinned! 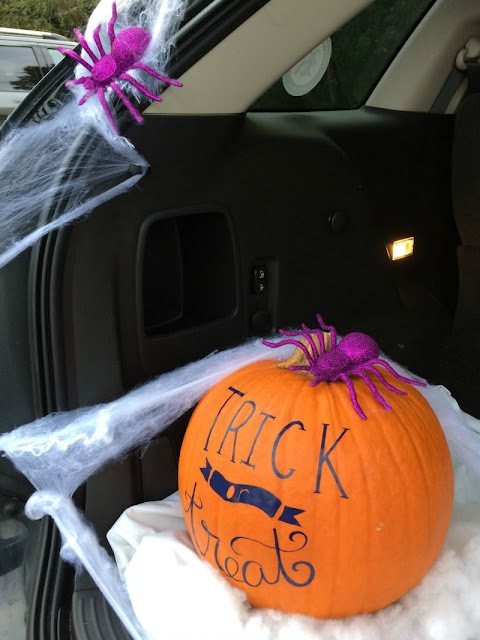 Thanks for linking up to Halloween Blog Hop 2017!